Create residual income with the unique Perfekt Earth affiliate program. When you find a product you really like, it's easy to share it with others. So what makes this affiliate marketing plan unique? Most affiliate programs pay you a one time referral fee. Perfekt Earth is going to continue paying you each time your referred customers buy this amazing natural, organic soil enhancer. Now if you don't have a blog or website, but still want to share Perfekt Earth, we have options that will work for you in the Perfekt Earth affiliate program. 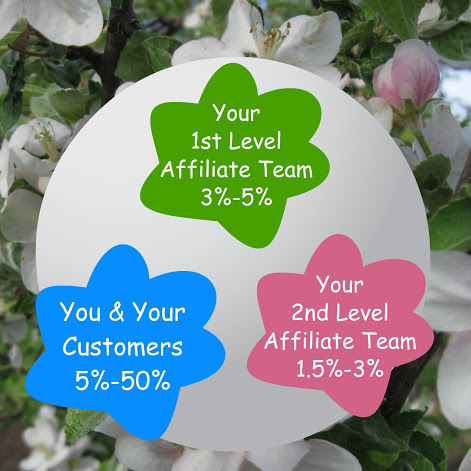 There is a little bit of a difference between an affiliate and a distributor, but both can build an affiliate-distributor team. So here's how it works. To be an Affiliate you need to refer someone to Perfekt Earth using the internet. The source of the internet referral must be trackable, and the cookie will be valid for 30 days. If a customer purchases something within those 30 days, the customer's future purchases will continue to be tied to your affiliate account. When one of your referred customers buys Perfekt Earth, you get paid. They're going to love it and want to come back to get some more. You'll get paid again and again. Every year your customer's garden soil will continue to improve as they use Perfekt Earth, and every year you will continue receiving income from Perfekt Earth. Your part is so simple. You spread the word and Perfekt Earth does the rest. They receive and ship the orders. Remember to tell your customers orders over $100 ship for free. The more you share, the higher percentages you earn. The percentages are based on your combined customer purchases for the month. Another option is to become a Distributor. Anyone can do this. All you need to do is order ten gallons of product and fill out and sign the distributor application and contract. Distributors pay 50% of retail for their product. Each time you order product, you need to buy a ten gallon minimum order. Distributors pay shipping costs. As a distributor, you can easily double your investment. Gardeners love to talk about what they're growing and what makes their garden so beautiful. If you own a nursery, are part of a garden club, or just love talk about gardening; consider becoming a distributor. Not only do you receive residual income on repeat customer purchases, but you can also build an Affiliate Team. Some of your customers will want to become an affiliate or distributor. When they do, they become part of your team. With the Perfekt Earth affiliate program, you earn a commission on everything your affiliate team purchases and everything their customers purchase. The more your team shares, the higher percentages you earn. The percentages are based on your combined 1st and 2nd level affiliate team purchases for the month.